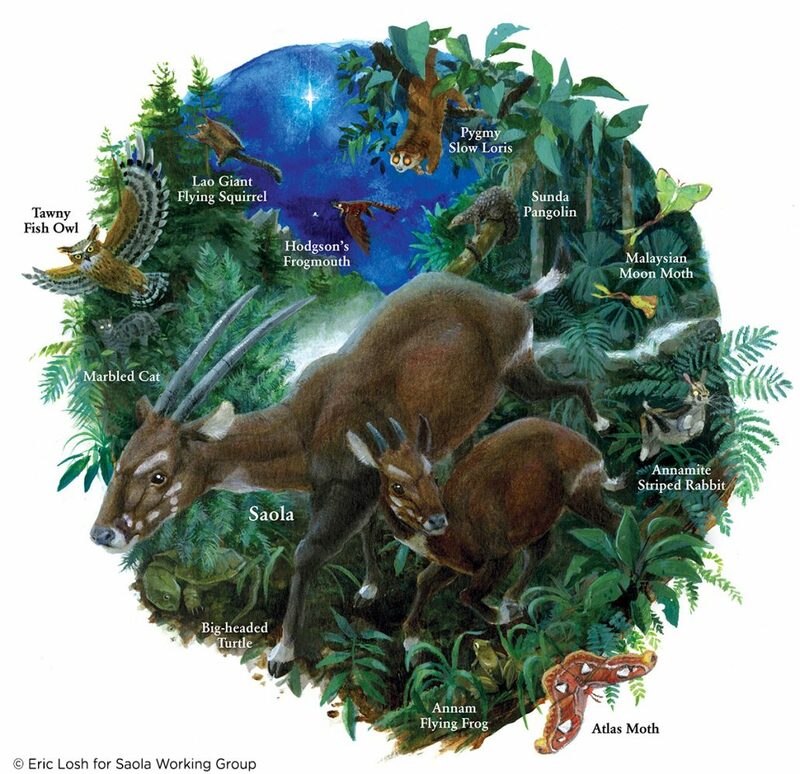 The Saola Working Group works collaboratively to conserve Saola in nature, and to leverage Saola as a flagship for conservation of the bio-cultural diversity of the Annamite Mountains as a whole. In other words, the One Plan approach is the full integration of what were formerly often separate conservation tracks – captive breeding of animals as a guard against extinction and for future re-introduction and conservation of animals in the wild. Although captive breeding (aka conservation breeding) is an option of last resort, for a highly threatened species like the Saola, it is imperative to begin conservation breeding while there is still time for it to be successful and supportive of the species’ survival. The membership of the SWG has evolved to reflect the emphasis we now place on the One Plan approach – as of this writing, the expertise of ten of our members lies predominantly in the husbandry and conservation breeding of wild ungulates. Saola Conservation Projects bring scientists, local people, government officials, and organizations together to help save this remarkable animal. Each of these projects contribute to the overall conservation of Saola in Laos and Vietnam by improving our understanding of Saola natural history, building consensus with local peoples about the important of conservation, and training conservation officers to reduce critical threats. Your help is needed to keep this important work going, and to save the Saola from extinction. Saola conservation projects occur throughout the Annamite mountains in both Laos and Vietnam. Some of these projects and their partners are highlighted below. SWG member Dr. Camille Coudrat (kneeling) and Chanthalaphone Nanthavong (right) with the Project Anoulak team at their new field station in Nakai-Nam Theun National Protected Area, Laos. (Photo courtesy of Project Anoulak). Nakai-Nam Theun National Protected Area (NNT NPA) is one of the largest remaining contiguous and little-encroached forest blocks in the Indochinese peninsula with about 4000 km2 (with two corridor extensions) and holds numerous rare, endemic and highly threatened species. It falls in the heart of one of the richest regions of Southeast Asia in terms of biodiversity and endemism and is one of the identified ‘Key Biodiversity Areas’ within the Indo-Burma biodiversity hotspot (Tordoff et al., 2012). NNT NPA is under the management of the Nam Theun 2 Watershed Management and Protection Authority (WMPA). The Saola Working Group has been involved in the region, in collaboration with the WMPA, since 2005 with various saola surveys via camera-trap methods, leech-based saola DNA detection techniques and assessments of habitat and threats for saola in the NPA. SWG partner Project Anoulak has been working in NNT NPA since 2011. Project Anoulak is an NGO that collaborates with the WMPA and is involved in wildlife research, conservation education, capacity building and localized patrolling. In 2015, the NGO set up a research station in one of the ‘Biodiversity Core Zones’ of the NPA. The UK Government’s Darwin Initiative assists countries that are rich in biodiversity but poor in financial resources to meet their objectives. Cambridge University has a 3 year project which supports the conservation of Saola and endemic muntjacs with targeted research. It is focused on the Thua-Thien Hue Quang Nam landscape in Vietnam. Nicholas Wilkinson, the project officer, is working closely with WWF and Vinh University. The project supports conservation planning, an analysis of hunting in the region, and monitoring of key threats to the species. The project is also providing support for enforcement and developing Saola monitoring methods. This project is focused on surveys to assess the size of Saola population and distribution in the study area, as well as for additional wildlife species of conservation concern. Results gathered from the surveys in this highly important habitat will be used to develop a Saola conservation landscape to include the natural reserve as its centerpiece. As a part of this project, staff are conducting surveys and engaging local communities to assess threats to Saola and potential socio-economic factors to be used in the conservation of the region. This project is focused on implementing landscape-scale conservation planning in the northern Annamites of Lao PDR. These two protected areas fall within the Saola Working Group’s priority landscape for saola conservation, and will be the focus of a Living Landscapes Approach (LSA) to create a comprehensive plan for ongoing biodiversity protection in the area. This approach includes a strategic planning process to guide wildlife management within large landscapes of human influence and uses, multiple stakeholder involvement, and GIS modeling, monitoring and evaluation to measure success in the area. This project is intended to produce real conservation results utilizing on-the-ground strategies in the high Annamite mountains. WCS Lao will conduct field studies of the landscape to identify areas with highest likelihood of supporting core Saola populations. These areas will become the focus of enforcement and outreach methodologies to be implemented in parallel with local capacity-building. As a part of this effort, forest substations will be established for conducting patrols, with input and consultation from local governments and villages, and outreach and awareness programs will be implemented utilizing social marketing tools to increase local knowledge and understanding of Saola and general biodiversity conservation principles. The Xe Sap NPA is one of the least studied national parks in Laos, due to extremely limited access and difficult terrain. WWF Lao is currently developing strategies to implement survey this highly biodiverse and relatively unknown region in order to create management plans for the conservation of the area. Survey results will be used to implement patrols and community-based capacity-building techniques in order to ensure the protection of Saola and other native wildlife in the area. This project will focus on the collection of fundamental data on Saola ecology and biology utilizing radio and satellite telemetry. Studies will include the safe capture and sedation of Saola, biomedical examinations and collection of biological samples from individuals, release of animals with radio and satellite transmitters, and the monitoring of movements to gain insight on behavior, interactions, and foraging activities in their natural habitat. This project will provide the first data on animal behavior, size of home range, interactions and foraging requirements and will be essential to the successful management and conservation of the species.